Marigolds are annual summer flowers- easy to grow and flowering all summer. 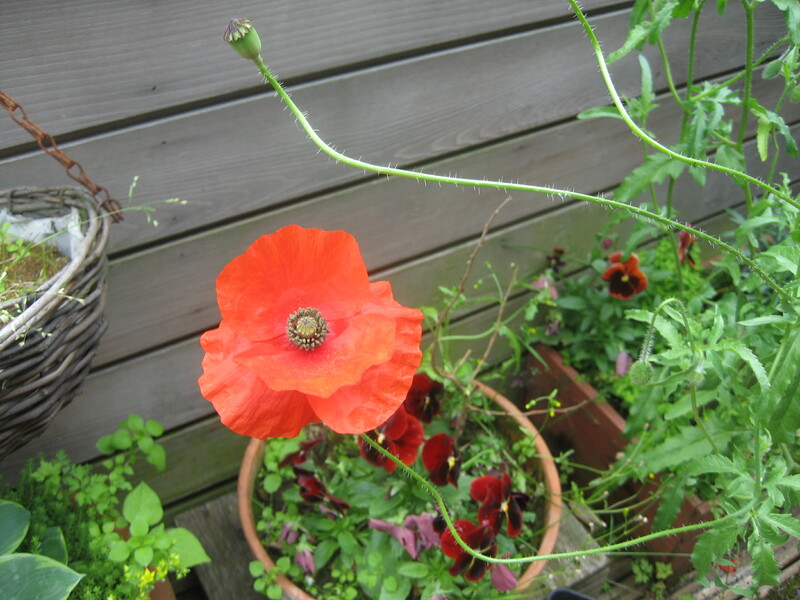 The flowers are cheerful and brighten up any garden, particularly small ones. The plants need sunshine but will grow in any good, well drained soil. Here I am growing them in a container. The seeds germinate easily, but watch out for damping off if you start them inside. Separate seedlings when they are about 2 inches tall. Deadheading makes the plants continue blooming profusely through summer. When watering marigolds, allow the soil to dry somewhat between watering, then water well, then repeat the process. Do not water marigolds from overhead. Water at the base of the plant. It has been long known that marigolds make important companion plants. The scent of the marigold (Tagetes spp.) repels animals and insects. 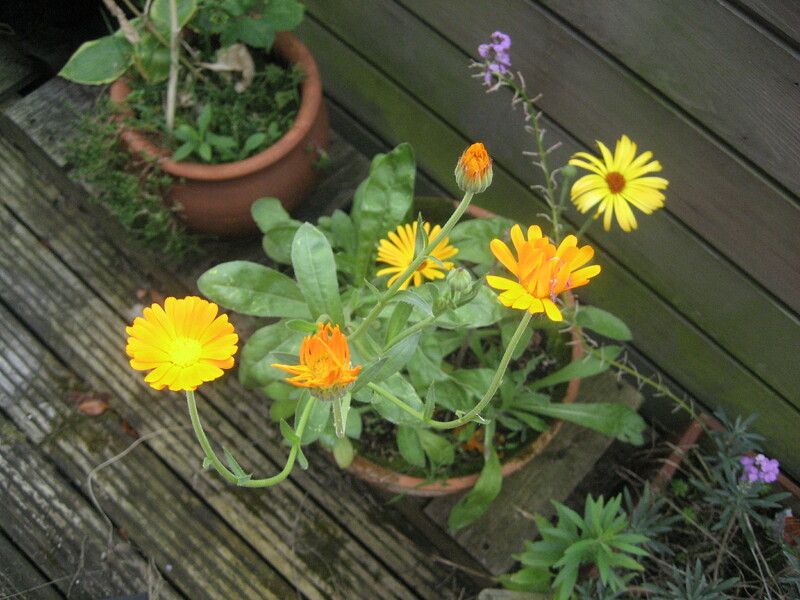 The underground workings of the marigold will repel nematodes (microscopic worms) and other pests for up to 3 years. 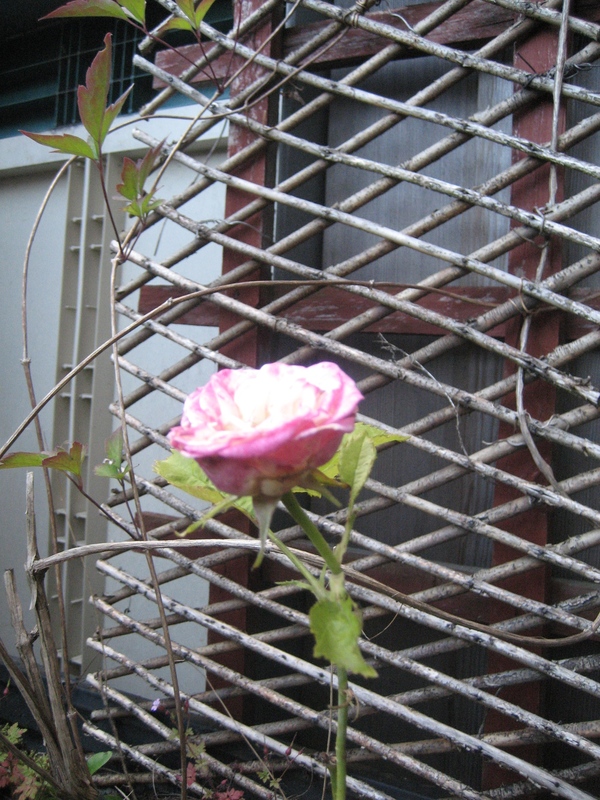 This rose came up in my garden. It is no ordinary rose. It flew in from Kenya, amongst thousands, and then was wrapped up in cellophane and labelled, stored, transported and finally put out on a supermarket shelf. It waited for a long time, and then it was on its ‘use by date’. It was in a bunch with a reduced price tag. I bought it because I love yellow roses. After a few days, when all the other stems were dried and wilted, one stem stayed green and even grew tiny roots. Thinking that this could do no harm, I stuck it in a pot. It stayed there for a year, offering only a tiny green leaf. This year, I was amazed to have this offering- a pink and yellow rose. Surely a gift of love, all the way from Kenya.